MEET RAY BAKER: The Ranch Boss at our Seattle location, he’s been with the company since 2004. The man is a stud, given a roll of Cordura, a pair of scissors, a needle and thread. “He’s one of the best pack sewers and designers… ever,” says hunting guru and Mystery Ranch marketing director Mark Seacat. Ray Baker, rockin’ the mutton chops, is photographing the trip. We’ll post his photos here when he gets back. MEET BRIAN TAI: He’s an experienced firefighter who started consulting to build fire packs in 2004, and joined the Mystery Team in 2008. These days, he heads up sales development and marketing for our fire line. 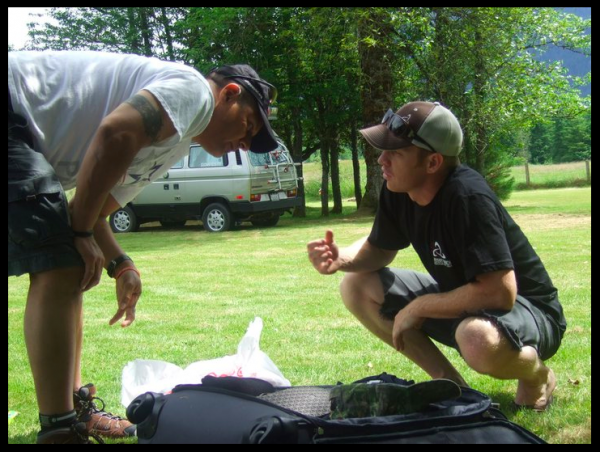 Brian Tai does some explaining at the basecamp in Ashford, WA. But this week, Brian and Ray will need more than superior sewing and selling skills to survive. They’re currently climbing the 14,411-foot Mt. Rainier with wounded veterans Derrick James Ford, Eric Andrew Cowan, and Gilbert “Mag” Magallanes as part of Camp Patriot, the organization that takes disabled vets on outdoor adventures. Seeing as Ford and Cowan have each had a leg amputated, and Magallanes survived the blast of a 2000-pound bomb with multiple injuries, the folks at Camp Patriot certainly could have picked an easier mountain. 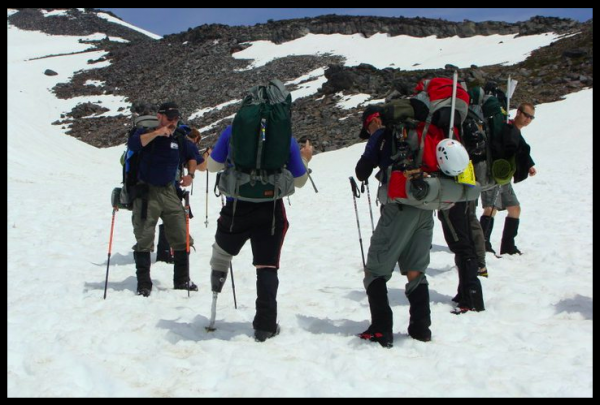 But for the fifth year in a row, this organization has been putting wounded vets on Rainier to give them a sense of adventure and victory. The guys have to earn it. The Camp Patriot Climbers on the Muir Snowfield, with Rainier’s summit looming ahead. 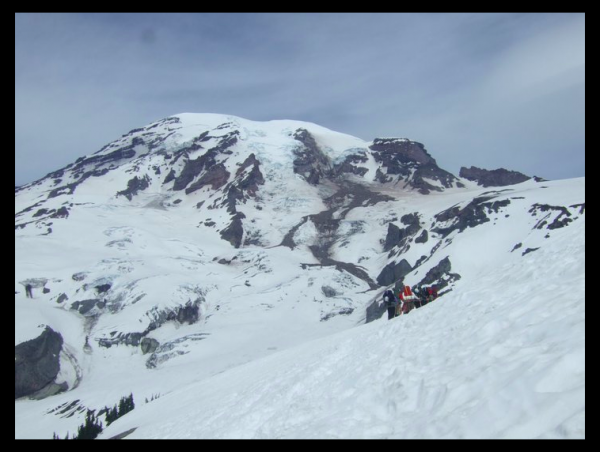 Rainier is the most glaciated peak in the lower 48, with 26 major glaciers grinding at its flanks. When moist frontal systems sweep in from the Pacific and collide with the mountain’s massif, violent storms can result, with precipitation and gales to sweep the ice clear of tents, equipment and the occasional unfortunate climber. Rainier’s 13,211-foot shoulder drop gives it more geographic prominence than K2, and climbers must ascend more than 9,000 feet from the parking area at Paradise. Once on the summit, they look down upon the mountain’s two volcanic craters. Geothermal heat radiating from those craters has created the largest glacial cave system in the world, with two miles of passages winding down through the ice to reach the highest crater lake in all of North America. 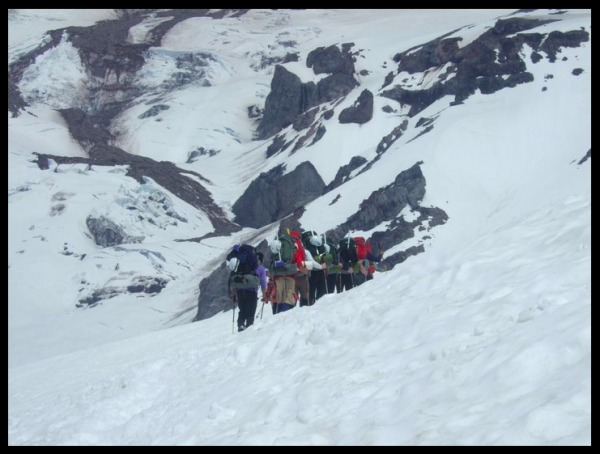 Camp Patriot climbers on the ascent to Camp Muir, the last camp before their summit push. Though he lives and works in the shadow of Rainier, Ray has never reached its summit. He did try once, but being pressed for time, he and a buddy attempted to push from Seattle to the summit in a single day. “Our legs were fine to keep going, but we just couldn’t stop puking. Altitude sickness will do that to you,” he says, laughing. Ray doesn’t think altitude will be much of a problem this time around, since he’ll have more time to acclimatize. And he probably knows what he’s talking about, since he’s no nube when it comes to high, frozen peaks. A couple years ago, he and a handful of other Ranchers headed to Alaska and climbed Denali. The mountain won’t be Brian and Ray’s only challenge. 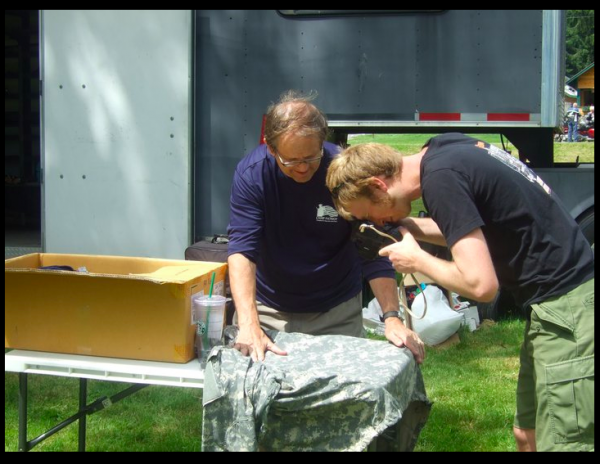 They are there to serve the veterans of Camp Patriot, and neither of them knows exactly what that will entail, either physically or emotionally. They are, however, determined to do whatever is needed, and seem downright excited to get to know the men who have sacrificed greatly for their country. “I want to get to know the guys,” Ray echoes. “But I don’t want to be too prying. I don’t want to cross lines or boundaries I’m unaware of,” he says. Curtis Fawley, lead guide (far left), arrives at Pebble Creek with two of the three climbing disabled veteran’s and other guide support members. Ray and Brian have given Mystery Ranch Backpacks to the veterans and volunteers to carry while making the climb. 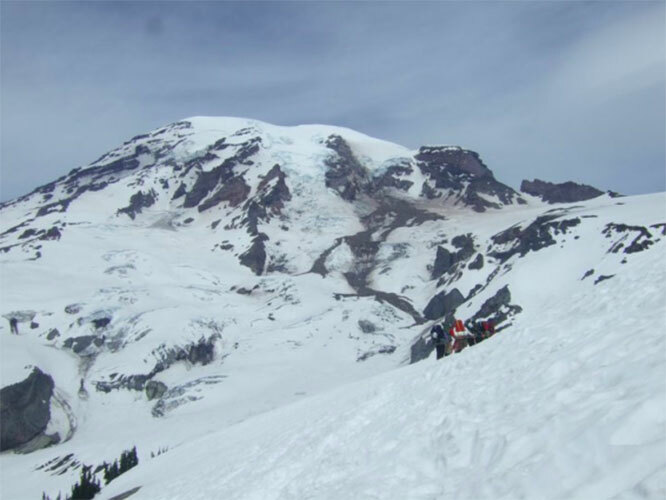 They were scheduled to leave from Camp Muir, 10,080 feet, at 12 a.m. this morning to make the final summit push. The forecast called for showers and a chance of thunderstorms, and the snow level dropped to 9,000 feet overnight. If the weather permitted, and all went well, Brian, Ray, Derrick, Eric and Mag are standing at the summit as we publish this post. Check back soon for more updates.